Light weight natural boulders suitable for do-it-yourself garden and landscaping applications. Available in 2. Packed in sturdy lattice wooden crates with hinged end side for easy boulder access. Colorful weather resistant display poster on 1 side. Crate mounted on standard pallet for fork lift or pallet jack movement and placement. FOB mill and FOB destination pricing. 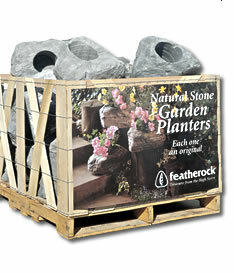 Silver gray in color, rugged in appearance, Featherock planters are a natural, lightweight stone of volcanic origin. Random shaped, but flattened on the bottom, they are sized for optimal indoor-outdoor use. The stone is chemically neutral and compatible with a wide range of potting plants. All Featherock planters have a drain hole to the bottom exterior of the planter. The Featherock planter is relatively maintenance free. However, it will have acquired residual dust during shipment and in sawing and drilling operations. Before using, wash off the planter with a garden hose. In garden applications, repeat hosing down occasionally to remove windblown dust, pollen and debris. Do place with care on varnished and other sensitive surfaces. Featherock planters are abrasive. Don't drop your Featherock planter. It is hardy and enduring but not indestructible. Packed in a sturdy slatted wooden crate mounted on a standard 4-way wooden pallet. Comes with a large 38" wide by 25" long, four color weather resistant poster and point-of-sale consumer literature. Featherock is a natural material. Planter sizes and weights are approximate. Packaging and merchandising for shelf and display. Light weight natural stone planters. Each one unique in size and shape. Suitable for do-it-yourself indoor-outdoor applications utilizing transplants or pop-in-and-out nursery containers. Silver gray color. Packed in a sturdy lattice wooden crate. Colorful weather resistant display poster and point-of-sale literature on 1 side. Crate mounted on standard pallet for fork lift or pallet-jack movement and placement. 48"l x 40"w x 28h"
48"l x 40"w x 32.5h"